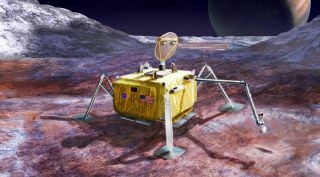 An artist's concept of a Europa lander, which would look for evidence of past or present life on the icy moon of Jupiter during a 20-day mission on the surface. WASHINGTON — The NASA team studying a lander mission to Jupiter's moon Europa says their work is continuing even though the White House is requesting no funding for the mission in its latest budget. In a presentation at a meeting of the Committee on Astrobiology and Planetary Science at the National Academies here March 29, Barry Goldstein of the Jet Propulsion Laboratory said that ongoing studies of the proposed lander are continuing, including a mission concept review scheduled for June. The administration's fiscal year 2018 budget blueprint, released March 16, proposed a record-high $1.9 billion for NASA's planetary science program, including support for the Europa Clipper mission that will go into orbit around Jupiter and make dozens of flybys of Europa. However, the document explicitly ruled out funding for the follow-on lander mission. "To preserve the balance of NASA's science portfolio and maintain flexibility to conduct missions that were determined to be more important by the science community, the Budget provides no funding for a multi-billion-dollar mission to land on Europa," the document stated. The lander mission, along with Europa Clipper, has enjoyed strong support from Congress, notably from Rep. John Culberson (R-Texas), chairman of the House appropriations subcommittee that funds NASA and an advocate of exploration of the icy moon that scientists believe is potentially habitable. Culberson, in recent years, has provided funding for Europa Clipper well above any administration request and at one point called for launching both Europa Clipper and the lander simultaneously. Culberson did not mention the budget proposal in brief comments at the end of the public lecture about Europa exploration here March 29, but did reiterate his support for sending both orbiter and lander missions there. He said he reached final agreement with fellow appropriators for a fiscal year 2017 spending bill that must be passed by April 28, when the continuing resolution that currently funds NASA and other federal agencies at 2016 levels expires. He didn't provide details about the contents of that bill, which has not yet been formally introduced, but said, "You'll be very pleased with the result." Goldstein, at the committee meeting, said the funding the proposed mission has received has helped make major progress on its design. "We've done an enormous amount of not only technical design, but also programmatic design, evaluating the capabilities and how long it will take to make this mission come to fruition," he said. That design, he said, permits a launch no earlier than October to December of 2025 on a Space Launch System rocket. No other launch vehicles, he said, have the performance to launch the lander mission, and even an SLS launch requires the use of an Earth gravity assist that would send the spacecraft to Jupiter, arriving in mid-2030. The choice of launch vehicle and trajectory is driven by the spacecraft's mass of 16.6 metric tons. By comparison, he said, Europa Clipper weighs 6 metric tons, and will be the largest spacecraft JPL has built to date. "Almost all of that mass is either liquid of solid propellant" to place the spacecraft into orbit around Jupiter and then Europa, and for the landing itself, he said. The lander itself will be able to accommodate a payload of 42.5 kilograms of science instruments, with a notional suite of five instruments proposed by scientists in a report released in February. Those instruments would support the goals of looking for evidence of life on Europa, assess its habitability and characterize the moon to support future missions there. The lander will use a "skycrane" landing system similar to that employed to the Mars Curiosity lander. Goldstein said early concepts of the lander looked similar to the 1990s Mars Pathfinder spacecraft, with petals to stabilize the spacecraft. "The team looked at that quite a bit and realized… that it was very susceptible to 'pathological' landing cases that would end the mission," he said, referring to the jagged terrain seen on much of the moon's icy surface. The lander will instead use what Goldstein described as the "cricket" design, with four landing legs in lieu of petals. The battery-powered spacecraft is designed for a 20-day mission after landing, although that could be extended depending on how many samples the spacecraft collects and processes with its robotic arm. At the end of the mission, the spacecraft will self-destruct using a "thermite-based incinerator" to comply with planetary protection requirements. That system can also be triggered if the spacecraft loses contact with the Earth. "Like in 'Mission Impossible,' we'll hit the self-destruct button and sterilize," he said.